Note : Your request will be directed to Fairview Microwave. 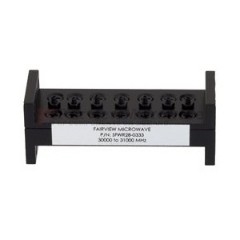 The SFWR28-0333 from Fairview Microwave is a Waveguide Filter with Frequency 30 to 31 GHz, Insertion Loss 1.5 dB, Rejection 60 dB. Tags: Band Pass. More details for SFWR28-0333 can be seen below. VDI15.0BPFE59.4-61.6 from Virginia Diodes, Inc.